I felt like I knew my great-great-great grandfather, Henry Rogers, pretty well after studying his journal and writing Fips, Bots, Doggeries, and More, a book about his 1838 travels across five states. But even after all this time, that man can still surprise me! Over the weekend, I got a call from K. Larry Pyle, a retired Cincinnati architect with an interest in local history, particularly the mill built by my ancestors in the 1820s. He’d seen one of my recent blog posts about the mill. Larry told me something I didn’t know–Henry Rogers assisted in the development of the Obed Hussey reaper, which was patented in 1835. A reaper is a machine used to harvest grain. It was a huge time-saver for farmers who had harvested grain by hand, cutting it with heavy curved blades called scythes. Obed Hussey, a Quaker who had settled in Cincinnati, created the first reaper used in the Northwest Territories. “Who invented the Reaper? The full, honest answer is that Obed Hussey invented the Reaper. “Between April and July, 1835, John Lane and Henry Rogers (with Isaac and Clark Lane assisting in the work) at their respective places of business one mile north of Mt. Healthy, Hamilton County, Ohio, made to order of Obed Hussey one Reaping machine for S. F. and Algernon Foster, then of the same County and State. 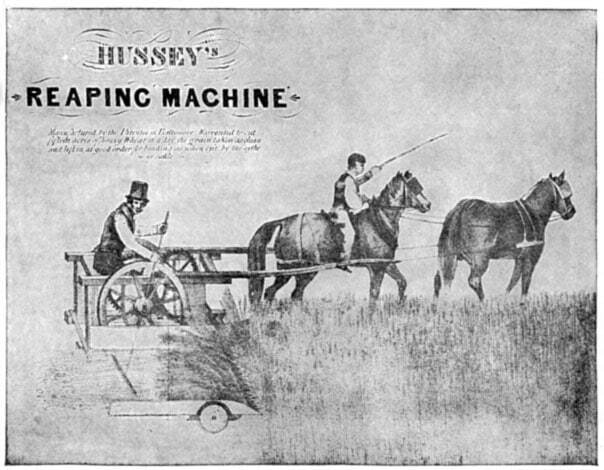 Said Reaper was made to conform to or with drawings and patterns made and furnished by the said Obed Hussey, who also superintended the work of making the machine, and witnessed its trial in the field near the middle of June, 1835, in presence of many farmers, mechanics and others near by where the same was made; and when and where it was delivered to the Messrs. Foster’s, who took this same reaper to La Porte County, Indiana, for the reaping season of the same year. Hussey’s innovation placed him in fierce competition with inventor Cyrus McCormick of Chicago. Both men made several patented innovations to the reaper, but McCormick proved the better marketer, and Hussey was finally driven out of business. He sold the rights to McCormick in 1858. Hi Tracy, Fun to follow a trail on the Internet. I was looking for a contact info for Larry Pyle, the architect you mention in this blog. I’m living in Mt. Healthy and interested in our antebellum history, particularly with respect to abolition and the Underground Railroad. The Lanes were allegedly participants in that (allegedly because I’ve found no primary sources to confirm this.) Was your ancestor a nearby neighbor? Do you have any handed down stories, or even diaries or other manuscripts, attesting to involvement in the Underground Railroad? I just poked around the Lane homestead the other day. The little stone cottage which I believe was the original blacksmith shop , probably where the reaper was fabricated, is still standing. The roof is caved in but the walls are as intact as the day they were built – really well crafted, no cracks. It’s a very neat bit of land and I like to imagine those earlier years when folks made their way up Hamilton Road by foot , wagon or horse. I’d love to hear if you have any oral or written history to share. I and some others are putting together a website that will launch on Feb 9 called Hamilton Avenue Road to Freedom.org. We’re trying to compile the history of abolition and the underground rr along this important route. Please refresh my memory, in what year did Henry Rogers Jr. pass away? Clarification: My question regarding Henry Rogers is directed to Tracy AND Karen. Henry Rogers, Jr. died in 1896, at the age of 90.